By one estimate, landslides triggered by heavy rain kill roughly 4,600 people each year. Scientists at NASA and elsewhere are trying to find ways to reduce that number. 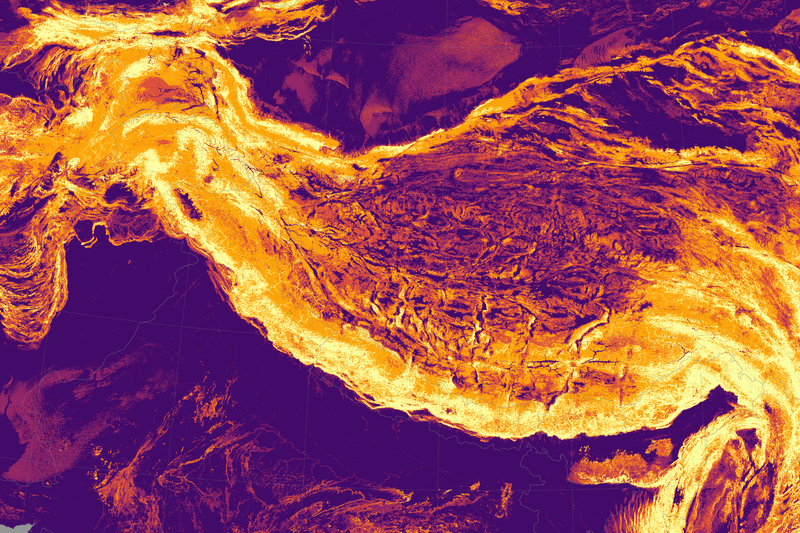 Dalia Kirschbaum and Thomas Stanley have taken one step in that direction by developing a new map of global landslide susceptibility. 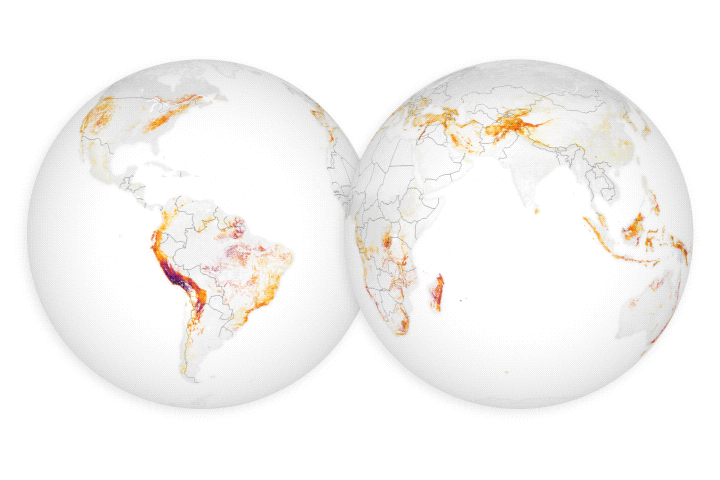 The map is part of a broader effort to establish a hazards monitoring system that combines satellite observations of rainfall from the Global Precipitation Measurement (GPM) mission with an assessment of the underlying susceptibility of terrain. Steep slopes are the most important factor that make a landscape susceptible to landslides. Other key factors include deforestation, the presence of roads, the strength of bedrock and soils, and the location of faults. While other scientists have previously developed global and continental landslide susceptibility maps, Kirschbaum and Stanley used improved versions of certain datasets. 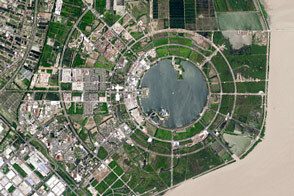 They used a better version of elevation data collected by the Shuttle Radar Topography Mission. 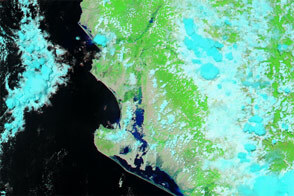 The forest loss information comes from a Landsat-based record of forest change compiled by a University of Maryland team. Neither dataset was available in 2007 when an earlier version of this map was published. 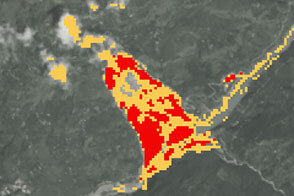 High-elevation areas tend to be quite susceptible to landslides. 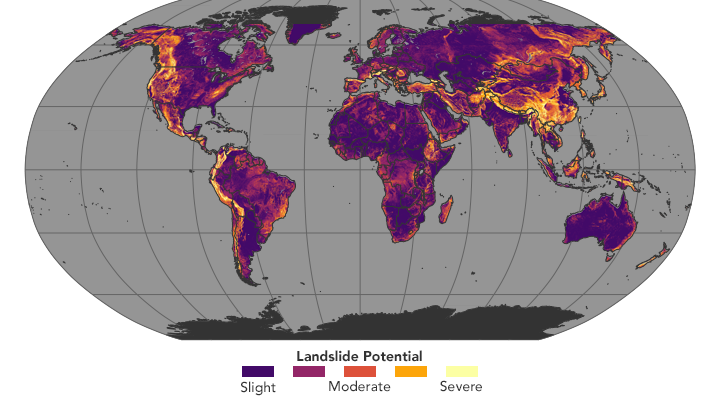 As seen in the map at the top of the page, many of the areas with the highest potential for landslide activity are found in steep mountain ranges, including the Himalayas, Andes, and Alps. 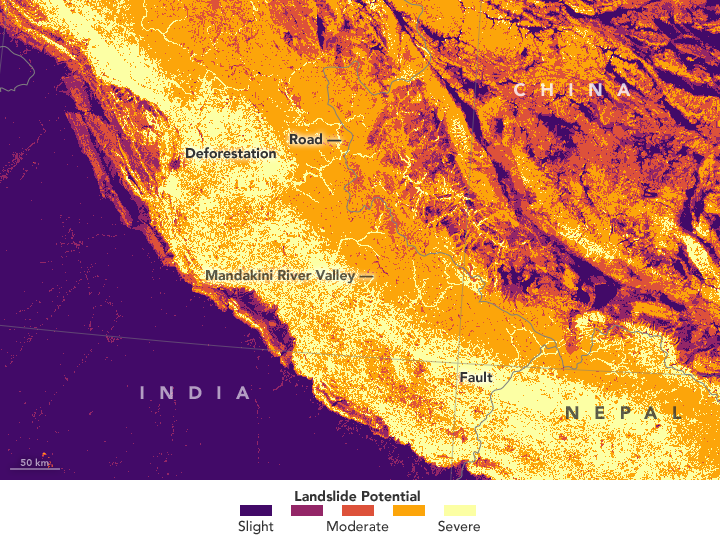 A detailed view of part of the Himalayas in northern India, Nepal, and China (second image) makes clear that steep slopes are not the only factor. In this region, valleys with roads (narrow yellow features), areas with deforestation (speckled yellow features), and major tectonic faults (thick yellow bands) have the most potential for landslides. 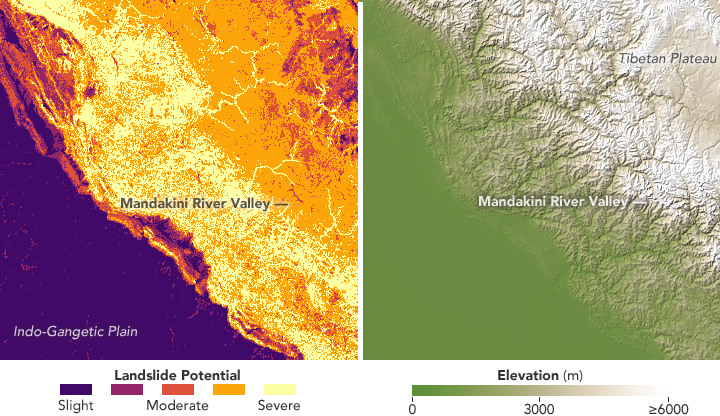 A comparison between elevation and landslide susceptibility (the third image) shows that many of the lower-elevation areas in the Himalaya foothills are more susceptible than steeper, high-elevation areas on the Tibetan Plateau. This is because all of the faults, roads, and forest losses in this area make the terrain vulnerable. In 2013, the Mandakini River Valley—an area flagged with severe landslide potential—was the site of a devastating landslide. After drenching rains pounded the region, many thousands of people (some estimates put the number as high as 12,000 to 15,000 people) were killed when mudflows and floods surged through Kedarnath and other towns in the valley. 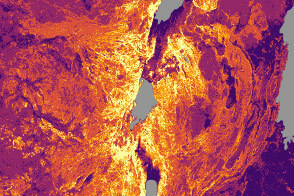 NASA Earth Observatory images by Jesse Allen, using landslide susceptibility data provided by Thomas Stanley and Dalia Kirschbaum (NASA/GSFC), and topographic data from the Shuttle Radar Topography Mission (SRTM). Text by Adam Voiland. Steep slopes, roads, underlying geology, and forest loss can all make landslides more likely. EOS (2016, October 6) Tracking Landslide Hazards Around the World, Pixel by Pixel. Accessed March 29, 2017. Nature (2012, August 8) Death toll from landslides vastly underestimated. Accessed March 29, 2017. 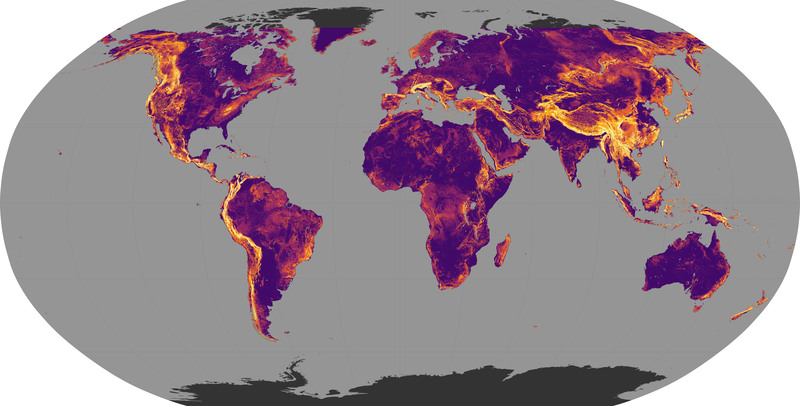 NASA Precipitation Measurement Mission (2017) Global Landslide Model. Accessed March 29, 2017. NDTV (2016, June 8) Kedarnath: 3 Years After The Disaster. Accessed March 29, 2017. Stanley, T. & Kirschbaum, D. (2017, February 7) A heuristic approach to global landslide susceptibility mapping. Natural Hazards, 1-20.